As you read this book, there are a few things you have to understand: 95 percent of my stories are truthful. Every member of the Robertson family has the God- given gift of storytelling. Hey, when you’ve sat in a duck blind for more than half of your life, you have to figure out some way to pass the time! It’s better than looking at Willie and Jase for six hours! Many of the stories I like to tell happened when I was a young boy or when I was in Vietnam. At my age, a few of the details are cloudy, but I’ll recollect the coming stories as best I can. Hey, just remember it isn’t a lie if you think it’s true! It’s up to you, the reader, to figure out what’s truth and what’s fiction. Best of luck with that, Jack! May the force be with you. Hey, another thing you have to know: my stories are kind of like my vocabulary. You might have noticed I like to say ‘hey’ quite a bit. ‘Hey’ can mean anything. It can mean ‘yes’, it can mean ‘maybe’ and it can mean ‘no’. Hey, it could mean ‘next week’. The bottom line is, you have to understand ‘hey’ to understand me. And if you know anything about Silas Merritt Robertson, you know I’mm a hard rascal to figure out. 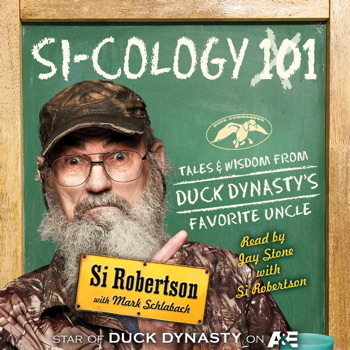 If you’re a fan of the A&E hit Duck Dynasty, this book is a must read/listen. I’ve heard some people say that if you’ve never seen the show, you probably wouldn’t like it, but I think it will make you want to check the show out. After all, how could anybody not like Si? He’s honest, hilarious, can find fun in just about anything, and very loving and humble. This is more of a biography, and that’s what’s so interesting about it. Through these stories you’ll get to know Si better, and see a different side to him than what you see on the tv show. He talks about being in the service, his childhood, his family and more. I tend to be picky when it comes to narrators. You have to listen to them for hours and they can get on your nerves after a while. Jay Stone read this and I thought he did a great job. I’ve been trying to get my husband to listen to audio books for years since he can’t hold print books and turn the pages (he’s a quadriplegic), but he was never interested until I got a copy of this audio book for review from Audiobook Jukebox. He listened to this all the way through without stopping, and said he loved it! Like my husband, I definitely recommend this! Si Robertson, one of the stars of A&E®’s Duck Dynasty®, has worked and hunted for Duck Commander since retiring from the United States Army in 1993. Si spends his time making all of the reeds for the Duck Commander calls and working with his brother Phil to prepare for the next duck season. Si lives in West Monroe, Louisiana, with his wife, Christine. thanks for stopping by Vicki, I’ve never gotten into the A&E show, not sure why. So glad your husband was patient enough to try audio. RE: your comment on the recipe, I wouldn’t make this recipe just for dinner, it would have to be multiple eaters. I’ve often thought of substituting ground chicken, just to try it. When I make for my family, I tend to freeze quite a few, “meat tarts”, they are great when you’re just out of ideas for a meal. I like that you can freeze them. Sometimes my son has to fend for himself! I never saw the A&E show, but this sounds good. Glad you and your husband enjoyed it. You should try the show, it’s hilarious!